On my newly acquired 1996 Mac 26X I failed the gooseneck on my second sailing trip. The previous owner wrapped the main sail around the boom for storage. I'd like to be able to do this also. What gooseneck do I buy and where can I get one quickly? My gooseneck has fractured twice, quickly replaced by a phone call to the factory. In my case it's an aluminum casting that inserts into the front of the boom extrusion, but your furling gooseneck was not a standard, off-the-shelf item. If I've said it once I've said it a thousand times I don't understand the way Macgregor designed the Gooseneck. It's well underrated and the use of a vang puts the quarter inch bolt under a huge amount of stress while the Gooseneck tube swings from side to side slowly cutting it's way through the bolt!!.... So lucky I saw this coming! !...see below. I need to improve on this greatly. Might replace the tube with a solid SS bar and an 8mm SS bolt..... Unless anyone has any other suggestions? On my 95 26X the original goose neck was a solid piece of aluminum rod. 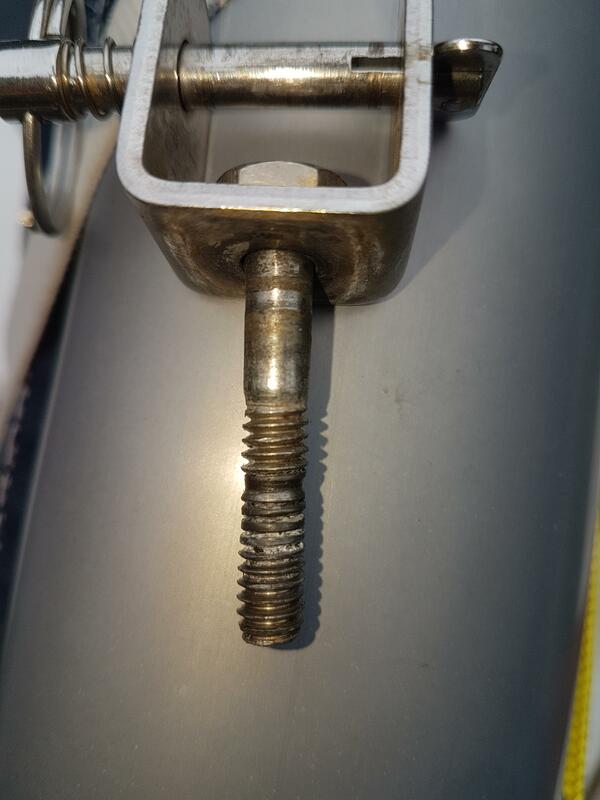 The short 1/4" bolt they used put threads in the wear area so not surprisingly it cut through the aluminum pretty quickly. I suspect they chose that part to be sacrificial in case of an accidental jibe so as not to take down the rig. I replaced the aluminum with a piece of solid stainless square rod. I chose a longer 1/4 in bolt so the shoulder fit all the way through the bracket and rod then cut off the excess threads. 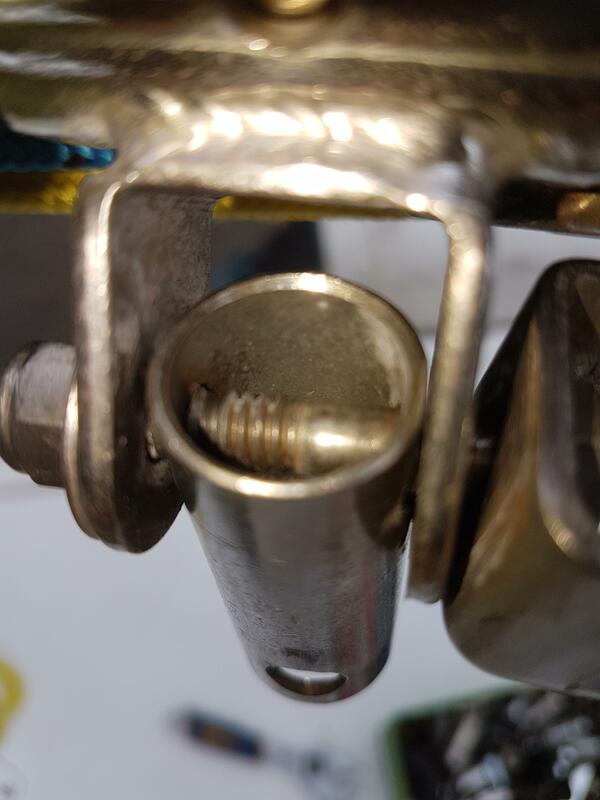 I also took this time to make a new cringle hook to get the threads out of that pivot as well. It's now 22 years later and no notable wear on either piece. I never gave it much thought, but you are right. That is a poor design. It works, but is not very durable. I've always thought it seemed weak. But then again, most of the standing rigging seems weak. Many sailors have replace the foresay with a thicker gauge. I'd love to see what you come up with as a stronger connection. BTW...OLD THREAD reboot. Just shows how valuable this site is when a 13-year-old thread gets resurrected. I was thinking "What's wrong with Frank C's profile. Now I know. Don has got a good idea with using a longer bolt and cutting off the excess thread. If the threads are not in contact with the gooseneck tube then there should be no "cutting" or excess rubbing from the threads. Also correct, the gooseneck tube was originally a solid aluminum piece. I believe this changed in 1997. 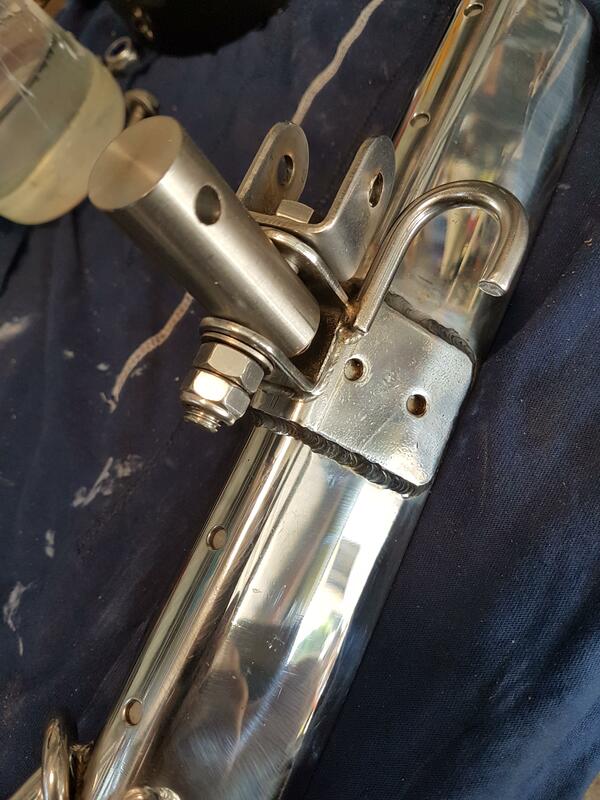 I cannot say for absolute certain why it was replaced with the hollow stainless tube but I suspect that the assertion could be correct, that the stainless bolt was really cutting into the aluminum. RussMT wrote: BTW...OLD THREAD reboot. Just shows how valuable this site is when a 13-year-old thread gets resurrected. I current have the "aluminum casting that inserts into the front of the boom extrusion" so it sounds the same as what Frank C spoke of. I've found some 16mm SS bar which inserts into the current gooseneck tube and I could weld them together (or I could buy some 20mm Solid bar). But I'm wondering if I should just scrap it all and start again .... Possibly include a rotating Boom (furler) solution at the same time .... Someone here has that but I can't find the thread?? Here's one thread where boom furling was discussed. May not be what you're looking for. Thanks but there was another that showed someones fabricated rotating gooseneck. A combination of Metal and Nylon. 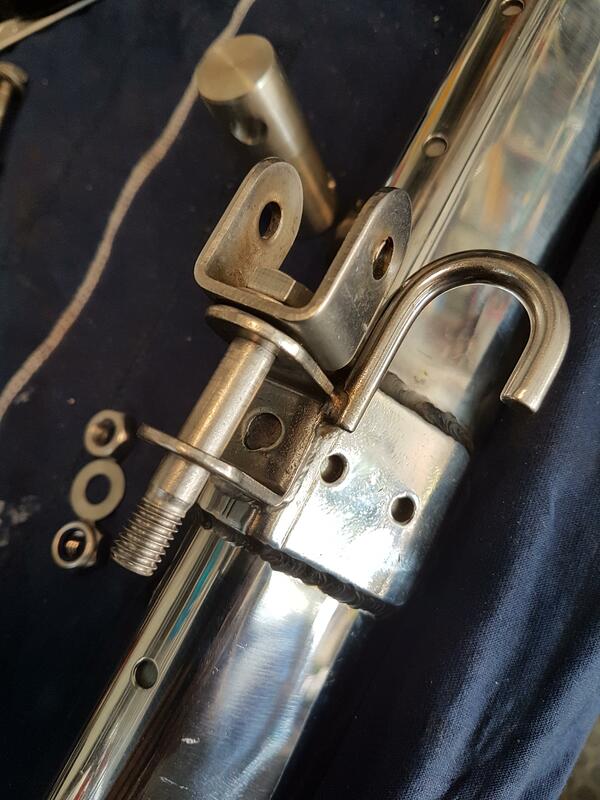 Firstly I replaced the old tube with a solid 316 SS Bar to spread the load on the bolts. On the mast side I drilled out the bar and mast bracket holes to 8mm which got rid of the 1/4" elongated (worn) holes. I then bought 8mm SS bolts with a blank (non-threaded) section in excess of 27mm and cut off any threaded section not required. And used a spacer (drilled out SS nut in my case) to allow the nyloc nut to tighten up the bolt to the bracket. Hi guys. I made a few assemblies that replaced this connection with one made of stainless and UHMW poly which was less sloppy and more robust than the stock one and also allowed the boom to rotate to give the option of rolling the main around the boom. I believe I have in storage (if I can find) the components and material to make another one or two sets. It might be a week or so before I can get there, but will let you know when I do if anyone might be interested. There might be a thread here somewhere on this, am mobile now but will look later tonight. seahouse wrote: Hi guys. I made a few assemblies that replaced this connection with one made of stainless and UHMW poly ... It might be a week or so before I can get there, but will let you know when I do if anyone might be interested. Are yes seahouse it was you that made that rotating gooseneck. I saved some pictures but I can't find the thread now. Are you just using it for storage? I'd really like to use the boom as crude furler. I was actually thinking of having a rotating fitting at the end of the boom so I could hold the boom up with the toplift and rotate it as I lower the main (into the wind) .... Do you see that working or would it be impractical? ... Would appreciate your thoughts on this. I don't have the boat any more (all work in progress stopped) and various things are in storage, so am working from memory, this link might give you some info in conversation on it. Somewhere in that thread Mastreb gave a review, both pro and con, of the piece I made. As I recall as far as using it as a furler there was the issue of the boom vang (which can simply be removed to solve it) and the main sheet attachment bale being in the way and needing to be relocated. I was working on a spiral track to handle the bolt rope on the mainsail which was another barrier to smooth, single-handed operation. Photobucket held some of my photos for ransom so some of the photo links of the pivot might or might not work. Yes, I also made a crank with a knob that got hooked onto the end of the topping lift for rolling the boom. But it still took a second person at the mast to make it work. I did not see the problems as insurmountable, but I did not see any solution that was going to be easy to implement on a small scale.